For the album by Cecil Taylor, see Chinampas (album). Chinampa (Nahuatl languages: chināmitl [tʃiˈnaːmitɬ]) is a type of Mesoamerican agriculture which used small, rectangular areas of fertile arable land to grow crops on the shallow lake beds in the Valley of Mexico. Although different technology existed during the Post-classic and Colonial periods in the basin, chinampas have raised many questions on agricultural production and political development. After the Aztec Triple Alliance formed, the conquest of southern basin city-states, such as Xochimilco, was one of the first strategies of imperial expansion. 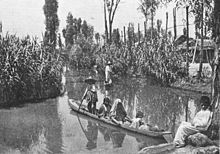 Prior to this time, farmers maintained small-scale chinampas adjacent to their households and communities in the freshwater lakes of Xochimilco and Chalco. The Aztecs did not invent chinampas but rather were the first to develop it to a large scale cultivation. Sometimes referred to as "floating gardens," chinampas are artificial islands that were created by interweaving reeds with stakes beneath the lake's surface, creating underwater fences. A buildup of soil and aquatic vegetation would be piled into these "fences" until the top layer of soil was visible on the water's surface. These agricultural lands received this nickname due to the illusion they caused. The bodies of land appeared to be "floating" on the water because the canals surrounded the chinampa plots. When creating chinampas, in addition to building up masses of land, a drainage system was developed. This drainage system was multi-purposed. A ditch was created to allow for the flow of water and sediments (likely including night soil). Over time, the ditch would slowly accumulate piles of mud. This mud would be then be dug up and placed on top of the chinampas, clearing the blockage. The soil from the bottom of the lake was also rich in nutrients, thus acting as an efficient and effective way of fertilizing the chinampas. Replenishing the topsoil with lost nutrients provided for bountiful harvests. Embarcadero-Jiménez and colleagues, tested the correlation between environmental parameters and bacterial diversity in the soil. It is speculated that a diverse array of bacteria can affect the nutrients in the soil. The results found that bacterial diversity was more abundant in cultivated soils than non-cultivated soils. In addition, "the structure of the bacterial communities showed that the chinampas are a transition system between sediment and soil and revealed an interesting association of the S-cycle and iron-oxidizing bacteria with the rhizosphere of plants grown in the chinampa soil". Evidence from Nahuatl wills from late sixteenth-century Pueblo Culhuacán suggests chinampas were measured in matl (one matl = 1.67 meters), often listed in groups of seven. One scholar has calculated the size of chinampas using Codex Vergara as a source, finding that they usually measured roughly 30 m × 2.5 m (100 ft × 10 ft). In Tenochtitlan, the chinampas ranged from 90 m × 5 m (300 ft × 20 ft) to 90 m × 10 m (300 ft × 30 ft) They were created by staking out the shallow lake bed and then fencing in the rectangle with wattle. The fenced-off area was then layered with mud, lake sediment, and decaying vegetation, eventually bringing it above the level of the lake. Often trees such as āhuexōtl [aːˈweːʃoːt͡ɬ] (Salix bonplandiana) (a willow) and āhuēhuētl [aːˈweːweːt͡ɬ] (Taxodium mucronatum) (a cypress) were planted at the corners to secure the chinampa. In some places, the long raised beds had ditches in between them, giving plants continuous access to water and making crops grown there independent of rainfall. Chinampas were separated by channels wide enough for a canoe to pass. These raised, well-watered beds had very high crop yields with up to 7 harvests a year. Chinampas were commonly used in pre-colonial Mexico and Central America. There is evidence that the Nahua settlement of Culhuacan, on the south side of the Ixtapalapa peninsula that divided Lake Texcoco from Lake Xochimilco, constructed the first chinampas in C.E. 1100. The earliest fields that have been securely dated are from the Middle Postclassic period, 1150 – 1350 CE. Chinampas were used primarily in Lakes Xochimilco and Chalco near the springs that lined the south shore of those lakes. The Aztecs not only conducted military campaigns to obtain control over these regions but, according to some researchers, undertook significant state-led efforts to increase their extent. There is some strong evidence to suggest state-led operations for the “expansion” of the chinampas. This is sometimes referred to as the hydraulic hypothesis, which is directly related to a hydraulic empire , which is an empire that maintains power and control through the regulation and distribution of water. There is evidence to support the idea of state involvement, primarily the amount of manpower and materials it would take to build, turn, and maintain the chinampas. However, arguments about state control of the chinampas rely upon the assumption that dikes were necessary to control the water levels and to keep the saline water of Lake Texcoco away from the freshwater of the chinampa zone. This is plausible, but there is evidence that the chinampas were functional before the construction of a dike that protected them from the saline water. It is suggested that the dike was meant to drastically improve the size of the chinampa operation. The Aztecs built Tenochtitlan on an island around 1325. Issues arose when the cities' constant expansion eventually caused them to run out of room to build. As the empire grew, more sources of food were required. At times this meant conquering more land; at other times it meant expanding the chinampa system. With this expansion, chinampas' multiple crops per year became a large factor in the production and supply of food. Empirical records suggest that farmers had a relatively light tribute to pay compared to others because the annual tribute may have been only a fraction of the amount necessary for local needs. 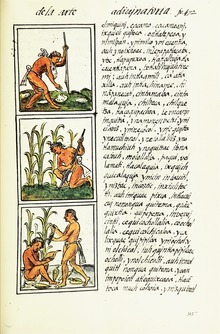 Chinampas are depicted in pictorial Aztec codices, including Codex Vergara, Codex Santa María Asunción, the so-called Uppsala Map, and the Maguey Plan (from Azcapotzalco). In alphabetic Nahuatl documentation, The Testaments of Culhuacan from the late sixteenth century have numerous references to chinampas as property that individuals bequeathed to their heirs in written wills. As of 1998, chinampas are still present in San Gregorio, a small town east of Xochimilco, in addition to San Luis, Tlahuac, and Mixquic. Although many of these floating gardens were constructed and thoroughly tended to from the Postclassic Period through the Spanish conquest, many of these plots of land still exist and are in active use. Many of these chinampas have been allowed by present-day farmers to become overgrown. Some choose to use canoes to farm, but many are becoming increasingly dependent on wheelbarrows and bicycles for transportation. Other fields, such as some located in San Gregorio and San Luis areas, have been deliberately filled up. As the canals dry up, several of the fields are naturally joined together. Although not used for their original purpose, they are commonly used for cattle feed. Other fields, both dried and surrounded by canals, produce foods such as lettuce, cilantro, spinach, chard, squash, parsley, coriander, cauliflower, celery, mint, chives, rosemary, corn, and radishes. The young leaves of quelites and quintoniles, which are often mistaken for weeds, are grown and harvested as ingredients of sauces. Flowers also continue to be grown on these plots. Some chinampa fields are even used as tourist sites. Ricardo Rodriguez’s business, De La Chinampa a Tu Mesa (translation: From the Floating Island to Your Table), acts as both. His company partners with local farmers to revitalize traditional agriculture through the use of chinampas, many of which are found on the canals of Xochimilco. In the effort to preserve the historical and successful chinampa farming process, Rodriquez has linked traditional production techniques with new technologies. Customers can sign up to receive fresh produce harvested from the chinampas to be delivered to their homes through his online website. Although many locals and farmers are happy to be returning to their agricultural roots, they are faced with several challenges. During the Spanish conquest, many of the lakes were drained. That unfortunately limited the agicultural capacity of the lakes such as the one at Xochimilco. In addition, in 1985, an earthquake struck, further damaging several of the canals. Other challenges include limited water supply, the use of pesticides, climate change, urban sprawl, and water pollution related to untreated sewage and toxic waste. ^ a b Jeanne X. Kasperson, ed. (1995). "Chapter 7: The basin of Mexico". Regions at risk: Comparisons of Threatened Environments. United Nations University Press. ISBN 978-92-808-0848-3. ^ Morehart, Christopher T. (3 June 2016). "CHINAMPA AGRICULTURE, SURPLUS PRODUCTION, AND POLITICAL CHANGE AT XALTOCAN, MEXICO". Ancient Mesoamerica. 27 (1): 183–196. doi:10.1017/S0956536116000109. ^ a b Onofre, Saúl. "The floating gardens in México Xochimilco, world heritage risk site". Retrieved October 1, 2017. ^ Dḥwty (April 7, 2014). "Chinampas, The Floating Gardens of Mexico". Ancient Origins. Retrieved October 1, 2017. ^ a b c d Nunley, Parker (1967). "A Hypothesis Concerning the Relationship between Texcoco Fabric-Marked Pottery, Tlateles, and Chinampa Agriculture". American Antiquity. 32 (4): 515–522. JSTOR 2694079. ^ Pedro Armillas, "Mesoamerica" in A History of Land Use in Arid Regions, L. Dudley Stamp, ed. Paris: UNESCO 1961, 266-67. ^ Embarcadero-Jiménez, Salvador; Rivera-Orduña, Flor N.; Wang, En Tao (2 October 2015). "Bacterial communities estimated by pyrosequencing in the soils of chinampa, a traditional sustainable agro-ecosystem in Mexico". Journal of Soils and Sediments. 16 (3): 1001–1011. doi:10.1007/s11368-015-1277-1. ^ Cline, Colonial Culhuacan, pp. 134-35. ^ Harvey, HR; Williams, BJ (31 October 1980). "Aztec arithmetic: positional notation and area calculation". Science. 210 (4469): 499–505. doi:10.1126/science.210.4469.499. JSTOR 1685035. PMID 17841389. ^ a b c Jorge Mdel, C; Williams, BJ; Garza-Hume, CE; Olvera, A (13 September 2011). "Mathematical accuracy of Aztec land surveys assessed from records in the Codex Vergara". Proceedings of the National Academy of Sciences of the United States of America. 108 (37): 15053–7. doi:10.1073/pnas.1107737108. PMC 3174618. PMID 21876138. ^ "Taxodium mucronatum". The Gymnosperm Database. Archived from the original on 2010-01-09. Retrieved 2009-10-12. ^ Cline, Colonial Culhuacan p. 2. ^ Baker, Jeffrey L. (June 1998). "The State and Wetland Agriculture in Mesoamerica". Culture & Agriculture. 20 (2–3): 78–86. doi:10.1525/cag.1998.20.2-3.78. ^ Morehart, Christopher. "The Potentiality and the Consequences of Surplus: Agricultural Production and Institutional Transformation in the Northern Basin of Mexico". Economic Anthropology. 1 (1). doi:10.1002/sea2.12010 (inactive 2018-09-23). ^ Calnek, Edward E. (1972). "Settlement Pattern and Chinampa Agriculture at Tenochtitlan". American Antiquity. 37 (1): 104–115. doi:10.2307/278892. JSTOR 278892. ^ Edward E. Calnek, "The Organization of Urban Food Supply Systems: The Case of Tenochtitlan" in Las ciudades de América Latina y sus áreas de influencia a través de la historia, Jorge Hardoy and Richard P. Schaedel, eds. Buenos Aires: Sociedad Interamericana de Planificación 1975. ^ Edward E. Calnek, "El sistema de mercado de Tenochtitlan," in Política e ideología en el México prehispánico," Pedro Carrasco and Johanna Broda, eds. Mexico: Editorial Nueva Imagen, 1978, pp. 97-114. ^ Jeffrey R. Parsons, "The Role of Chinampa Agriculture in the Food Supply of Aztec Tenochtitlan," in Cultural Change and Continuity, Charles Clelland, editor. New York: Academic Press 1976, 242. ^ Van Tuerenhout, Dirk R. (2005). The Aztecs: New Perspectives, p. 106. ABC-CLIO, Inc.
^ Cline, Colonial Culhuacan, p. 132. ^ Juan de Torquemada, Monarquia Indiana, vol. 2, 483. Mexico: Editorial Porrúa 1975. ^ Sigvald Linné, El valle y la ciudad de México en 1550. Relación histórico fundada sobre un mapa geográfico, que se conserva en la biblioteca de la Universidad de Uppsala [Sweden]. Stockholm 1948. ^ Calnek, Edward E. (1973). "The Localization of the 16th-century Map Called the Maguey Plan". American Antiquity. 37 (1): 104–15. ^ S.L. Cline and Miguel León-Portilla, The Testaments of Culhuacan UCLA Latin American Center, Nahuatl Studies Series, vol. 1 1984. ^ Chapin, M (1988). "The seduction of models. Chinampa agriculture in Mexico". Grassroots Development. 12 (1): 8–17. PMID 12342093. ^ a b c d e f g h i Crossley, Philip (1999). "Virtual Field Trip". The Chinampas of Mexico. pp. 1–14. Retrieved October 1, 2017. ^ The Editors of Encyclopædia Britannica; Pauls, Elizabeth (December 8, 2006) [July 20, 1998]. "Chinampa". Encyclopædia Britannica. Retrieved October 1, 2017. ^ a b c d e Godoy, Emilio (February 27, 2016). 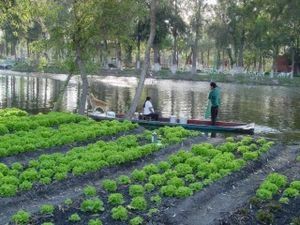 "Mexico's Chinampas – Wetlands Turned into Gardens – Fight Extinction". Inter Press Service News Agency. Retrieved October 1, 2017. ^ a b c d Tomky, Naomi (January 31, 2017). "Mexico's Famous Floating Gardens Return to Their Agricultural Roots". Smithsonian.com. Retrieved October 1, 2017. ^ Morehart, Christopher (2016). Ancient Mesoamerica. Cambridge University Press. p. 192. ^ DeWalt, Billie (June 1992). "Review: The Chinampas". American Anthropologist. 94 (2): 524. doi:10.1525/aa.1992.94.2.02a00910. JSTOR 680550.